An electronic cigarette is a portable, battery-powered device (often shaped like a traditional cigarette) that vaporizes e-liquid (containing PG and/or VG, selectable amounts of nicotine and any of hundreds of flavorings). It generates a smoke-like vapor and provides the same hand-to-mouth, inhalation experience as smoking, without tobacco or combustion. 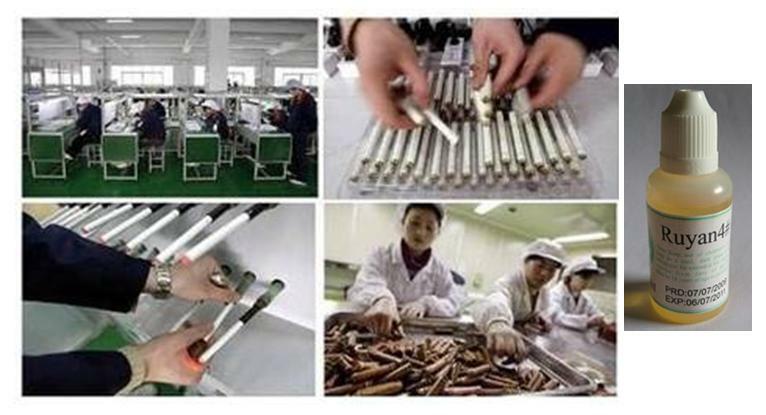 …and imported into the U.S. [oops, there’s my Yank perspective again] by myriad suppliers and vendors … or you can order directly from China (which I, and many others, have done successfully, e.g., from Heaven Gifts, EastMall, HealthCabin, or BestEcig). 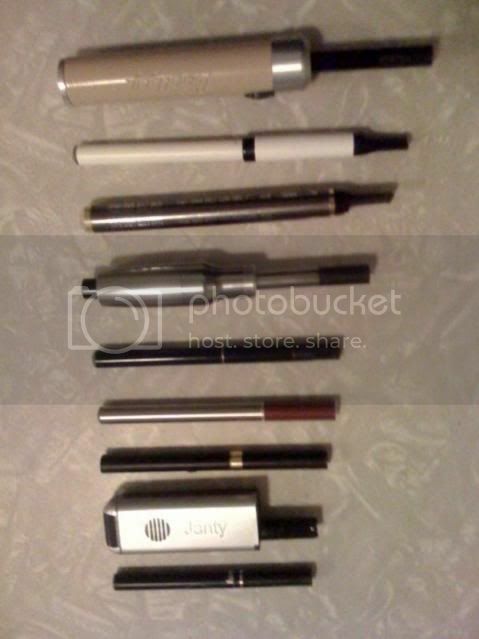 Most prospective vapers initially are attracted to an e-cig the same size or a bit smaller than the one at the very bottom of the above photo – the “Super-Mini,” e.g., Joye306/306a, M402/403, or RN4081. The next one up is a Janty Stick (one of the “Mods”). The third from the bottom is currently the most popular e-cig (among forums’ members) – the Joye510, voted Best Starter Kit in last year’s Vapy Awards. My first e-cig is the fourth one from the bottom (the silver & red one) – the KR808D-1 (another excellent choice), hereinafter to be abbreviated Kr8, pronounced Kreight. Above that is the DSE901, one of the very first, and still very popular, models (and once was Leaford’s recommendation for a new vaper). Next (the one with the bulge) is the Screwdriver, the first manufactured Mod. Above that is an e-cigar, which along with the e-pipe, were the first models to look like something other than a cigarette. My personal favorite, and one of the classics, is that long white model second from the top: the DSE801, one of the “Penstyles” (looks kind of like a ciggy in an old-fashioned cigarette holder). The three components of an e-cig (sometimes just two) – including manual vs. auto, voltage, mAh, resistance, exposed, high/low-bridge, colors, etc. The factors used to evaluate e-cigs, e.g., in review videos – vapor, flavor, throat hit, draw, battery life, watts, switch, etc. I started smoking when I was 11 after my parents divorced. When I was 16 I went to live with my dad and he tried to get me to quit by beating the S___ out of me and making me smoke 3/4 of a pack of cigarettes and eating the rest of them. I ran away the next day. Needless to say my desire to quit hasn’t been great since then. Even as I write this my desire to go smoke an analog increases, but I know it’s just because of that night. In other words its psychological not physical. As I get older I know I need to quit (44 now). 2 days ago I went and bought a vaporizer. Since then I have smoked 2 analog cigarettes. I know I don’t need the analog cigarettes, but I also know that a part of me (the childish part) feels like I’m letting my dad win with his barbaric tactics if I quit analogs. The more rational part of me knows that I’m choosing to quit, not because he’s right, but because I want to. Because it’s my choice. Because I choose to be healthy and not let what happened 28 years ago control my decision making process. Yeah so if it wasn’t for him switching from analog to ecigs would be a piece of cake. I don’t know if I can overcome his nastiness, but I will try my hardest to overcome it and give up smoking. It would help if I knew he disapproved of me smoking ecigarettes too, maybe I can convince myself of that and it will make the complete switch possible. Yeah that’s the ticket he would have wanted me to quit cold turkey so smoking ecigs would have been a crutch to him and would have pissed his sorry @$$ off. Oh boy, I’m starting to feel better! I feel better about smoking ecigs now and giving up analogs! For anyone who may have been in my situation, I’m posting this. It would be nice to say I’m quitting analog cigarettes because I know they’re bad for me and I don’t care what he may or may not have thought but it doesn’t quite work that way even at my age. To know that he probably would have disapproved of ecigs too (no testing how can you know they’re healthier) really calms down my cravings for analogs! Brenda, thanks for sharing your story. There always seems to be a reason to have another smoke, some have deeper roots than others. I hope you can continue with vaping instead of smoking. Just tell yourself that the son of a b____ wouldn’t like vaping either! Brenda, thanks for sharing your story. There always seems to be a reason to pick up another smoke and some are more deep rooted than others. I hope you can keep vaping instead of smoking. Just tell yourself that the son of a b____ wouldn’t approve of vaping either! I am 62yrs. Old & have smoked for over 50 yrs. when my son & his wife switched to e cigs I had him order my starter kit on my laptop. I haven’t wanted another analog cigarette since my first e cig. I will go back to “smoking”! I hope you meant you will not go back to smoking! It’s great to hear you made the switch. I smoked for as long as i can remember. I understand it hurts my overall health therefore I wish to stop smoking yet it is difficult. None of the stop smoking methods did the trick. Then I saw the e-cigarette. It has fortunetly changed my life. No longer sucking in smelly smoke feels magnificent!